Travel is a huge part of doing business as a sales executive – a study by Oxford Economics shows that approximately 40% of prospective customers are converted through an in-person meeting, compared to a scant 16% without such a meeting. With a gap this large in conversion rates, it’s clear that business travel is here to stay. However, this leaves us with an obvious (and expensive) problem. Year after year, companies find that travel and expense management is the second largest controllable expense category. To minimize these expenses, many companies (especially startups), have scrapped corporate travel agencies and are relying on their employees to plan their own travel on sites such as Kayak and Travelocity. But do you really want your best employees spending time on a basic administrative task when they could be selling, creating, or otherwise doing what you hired them to do? You can save both time and money by delegating travel management to a virtual assistant. 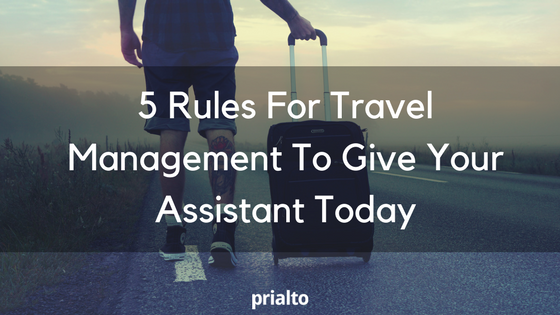 Here are 5 rules for travel management that you can pass to your virtual assistant that will help them make the right choices for your itineraries every time. Last-minute travel isn’t always avoidable, but there is a sweet spot for booking that can cut costs significantly. In fact, one day can make a huge difference when it comes to a jump in airfare. Of course, you’d expect your virtual assistant to minimize costs – but one cost that many people fail to take into account when booking travel is the cost of your time. Time spent traveling is time spent not doing the activities that bring in business. A bargain-priced flight is great, but if you’re spending 10 hours traveling that you could be spending with a client, the return on time invested is too low. Your virtual assistant can help you find a balance between a low-cost flight and an efficient itinerary. Travel vendors know that businesses have many options for low-cost travel. For larger businesses, sometimes this means it’s possible to negotiate discounts with a “preferred” airline, rental car company, or hotel chain. Even smaller businesses can capitalize on the benefits of using the same vendors routinely. Travel rewards programs often lead to perks which can save your company bundles on the “extras,” such as checked bag fees, airline lounge memberships and more. Business travelers have more to consider than just the flights they take. A great virtual assistant will take these other factors into consideration when planning your trip. Ground transportation, expense reporting, and booking services such as currency exchange and translation services for international travels are just a few of the details you can delegate. Your assistant can help cut costs by determining if a car rental is more time/cost efficient than taking a car service, or even booking rides through a rideshare service such as Lyft. The benefits of delegating travel planning can be huge when it comes to risk management. A virtual assistant will act as your advance team, notifying you of cancellations, delays or changes to your itinerary. Having someone on the ground who can monitor your travel and make the appropriate changes before you land can take a huge weight off your mind. They can also keep a detailed audit trail of your travel to demonstrate duty of care in case of an emergency. It’s smart to factor in locations with poor weather and a high frequency of cancellations or delays so that you’ll know what to expect as you travel. Your virtual assistant can also monitor travel to any risky locations that are prone to natural disasters or other risks to ensure your safety is always the priority. Find a dedicated assistant to plan your travel today.